What would you give to have an audience of over 8 million Facebook fans, 3 million Twitter followers, 2 million Instagram followers and customers all around the world? Brands dream of building a massive following, but few ever succeed. So when a company is able to build brand loyalty and a community of raving fans who engage on social media, show up to live events and recommend products, it’s pretty impressive. One brand that has done this all extremely well, is Razer. Razer sells hardware for gamers. Whether it’s a controller, keyboards or even a phone, Razer has become the go-to source for gamers looking for new gear. But their success didn’t happen overnight. It took over a decade for Razer to establish brand loyalty and build a community of people that not only are willing to buy their products, but become bonafide “fanboys” for the company. In this post, we’re going to do a deep dive into how Razer created so much brand loyalty in such a competitive industry. Plus we’ll take a look at how they’ve successfully used social media to engage with their audience and grow the business. Brand loyalty is when people have a strong affinity toward a particular brand. Brand loyalists are repeat buyers of a specific brand and will consistently buy from them over competitors. In the simplest terms, brand loyalty comes down to your ability to consistently meet the needs of your customers. If you become a trusted resource for the products they buy, they’ll come back to you every time they’re in need of what you sell. Before we dive into the specifics of Razer’s brand loyalty, let’s take a look at some examples from other companies as well. Essentially, these brand loyalists buy Apple products solely because it’s a new Apple product. So you probably see how beneficial brand loyalty can be. The ability to get people to buy your product without even considering alternatives means quicker sales and fewer lost opportunities. People love Chipotle so much they were willing to eat it during an E. coli scare. Now that’s brand loyalty. And who can forget this viral video of a kid professing his love for the Mexican grill chain? Aside from making delicious food, Chipotle does quite a few things to win over the stomach’s of hungry people. For one, they’re very transparent about their ingredient sourcing, business practices, sustainability and more. With people more concerned about animal cruelty and food quality than ever before, Chipotle’s choice to be open and honest about what’s going into the food they serve puts customers at ease. When you consider the fact that many other restaurants aren’t so transparent about where their food comes from, it makes a compelling case for people to choose Chipotle over the alternatives. Chipotle also does plenty more like offer discounts to teachers, medical staff and other promotions that make customers feel appreciated and coming back for more. Zappos has earned a stellar reputation for their amazing customer service over the years. So it shouldn’t come as much of a surprise that customers are loyal to them over other shoe retailers. Just how loyal are their customers? Well, an old report showed that 75% of Zappos purchases are from return customers. And 44% of new customers heard about the company through word of mouth. You don’t achieve numbers like that without going above and beyond for your customers. For example, there’s one story of a customer who needed to return shoes to Zappos but didn’t have time because her mother had recently passed away. After finding out what happened, Zappos paid to have a courier come pick the shoes up and do the return at no extra cost. But it didn’t stop there. Zappos also sent a basket arrangement to the customer to pay condolences for her loss. That small gesture likely resulted in a lifelong customer, who went on to tell friends and family about her great experience with Zappos. 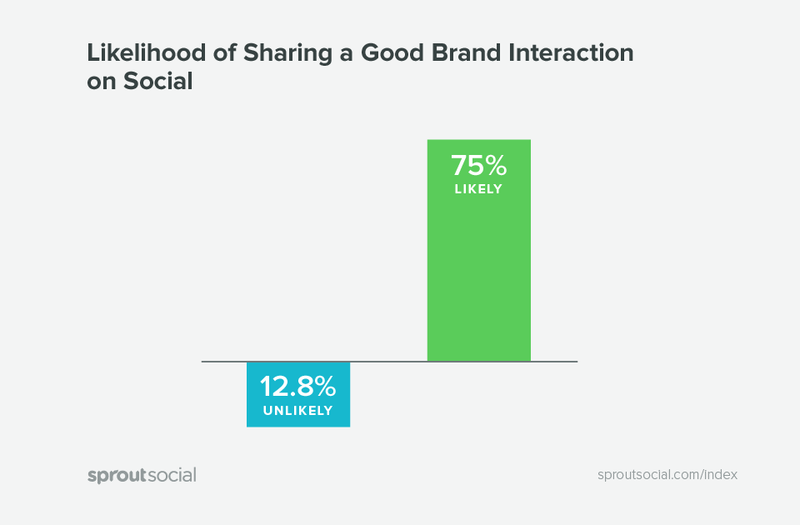 Our data showed that 75% of people are likely to share a good brand interaction on social media. In order to further solidify their excellent customer service and grow brand loyalty, Zappos takes the time to respond to their compliments on social media as well. Providing excellent service is a simple and very effective way to improve brand loyalty. So the next time you have a customer interaction, keep in mind it could have a long term impact. Those are just three examples of brands with loyal customers. Next, let’s do a deep dive into the main subject of this piece, Razer. Ok, so let’s talk about Razer’s brand loyalty. They have customers around the globe, and brand enthusiasts that engage on Facebook, Twitter, Instagram, Twitch and their Razer Insiders forum. Not to mention their in-person events draw huge crowds. What’s more, Razer’s audience is growing at a rapid pace. On Instagram alone, they’re averaging 3-5K new followers every day. Perhaps most important of all, their brand sentiment is very positive on social media. Looking at numbers is cool, but the question you’re all wondering is, how are they doing it? Razer makes it crystal clear who their products are for. They’re not marketing to college students looking for a school laptop or people that just want a computer to browse Facebook. They make products for gamers, period. Gaming is a common theme, which shows Razer has nailed their target audience. Think about your brand. Who’s your target audience? Is it clear that the products you provide appeal to a specific customer? 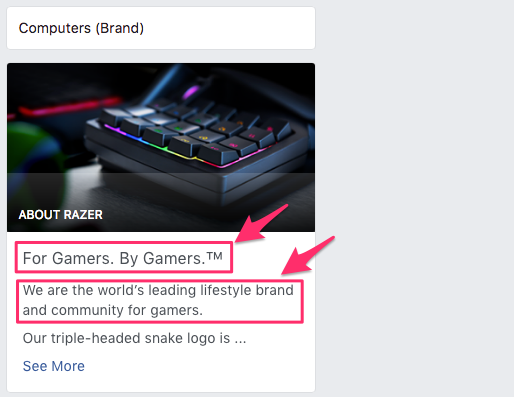 If you want to build brand loyalty and build a community like Razer, you need to find the common thread that connects your audience. It can’t just be something they kind of enjoy. It has to be something they’re passionate about. In addition to deciding their niche, Razer also has an in-depth knowledge of their audience. You can see it first and foremost through their products, which are constantly ranked at the top of lists for best gaming products. 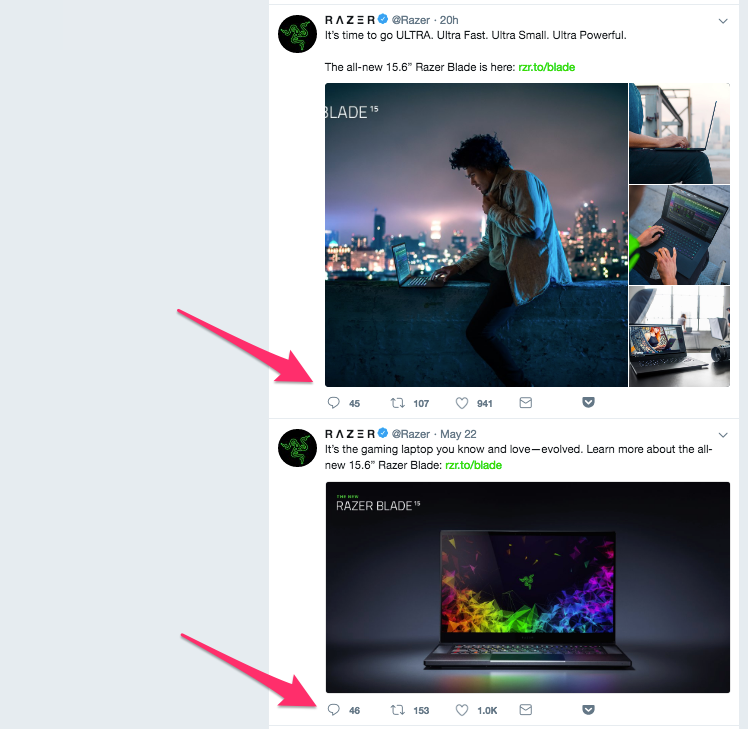 Beyond the products they make, Razer’s knowledge of their audience and industry is also evident in the way they speak to their followers on social media. You don’t create Facebook posts like that unless you know your audience. With pretty much every social media post, ad or other content Razer puts out, they speak directly to their core of gamers. The average person might not understand some of their references, but Razer’s perfectly ok with that because the people they want to reach get it. Want to know how to boost the credibility of your brand and community? Team up with people your target audience is already familiar with. That’s one of the tactics Razer used to grow its e-sports team, Team Razer. Team Razer is made up of a group of established e-sports teams. It’s a win-win situation for all parties. Razer gets more credibility in the e-sports world by aligning themselves with teams that already have a respected reputation. For instance, Razer recently announced two new teams joined Team Razer: the Immortals who have over 130K Twitter followers, and the Los Angeles Valiant with over 70K. The people who follow these e-sports teams are also gamers. If they weren’t using Razer products before, they’re probably much more likely to now that the teams they follow are endorsing them. In fact, one study found 70% of millennials are influenced by peer recommendations to buy products. Team Razer players and ambassadors also Tweet about the brand, which gives them added exposure. In a world where organic reach is on the decline, getting other people to Tweet about your brand significantly amplifies your reach. The partnerships don’t just benefit Razer though. The players receive financial backing, exposure and free products. The concept of using influencers or celebrities to build brand loyalty isn’t a new concept. In fact, Twitter itself blew up from celebrities like Ashton Kutcher using it to speak to their audience. You can do it too by finding influencers that have clout with your target audience. Don’t just look at follower count. Make sure they align with your brand and the partnership makes sense for everyone. Check out this guide to learn more about finding the right influencers for your brand. It’s hard to be loyal to a brand you don’t trust. Transparency is key for establishing brand loyalty. Back in 2013, Razer had an incident that’s a nightmare for every retailer. A coupon code that allowed customers to get 90% off their orders somehow got spread across the internet. The coupon code was clearly released by mistake, but Razer didn’t realize it until thousands of orders had been placed. At that point, most companies would have likely just canceled all the orders since it was an error. Razer stuck to their brand values of putting the customer first and agreed to honor the coupon. The loss obviously hurt their bottom line, but their decision to honor the discount earned them great PR and built a whole level of support and loyalty from their community. While extreme cases like this are rare, the main takeaway is Razer was very transparent about what happened and what they’d do to fix the situation. Had they been secretive and not faced the problem head on, the outcome could’ve been completely different. Instead of earning new customers and strengthening their brand loyalty, they could’ve just as easily gone out of business. Another example of Razer stepping up and being open was in 2016. The brand had a bit of a social media fail when they sent a Tweet poking fun at Apple’s Macbook release. While some of Razer’s fans didn’t have a problem with the Tweet, they still issued an apology when they realized many people found the Tweet offensive. Razer was clear and honest about what their intentions were with the Tweet and acknowledged it was probably in poor taste. Their response was overall well-received and their community appreciated their transparency. The process of building your brand isn’t always going to be full of sunshine and rainbows. You’ll make mistakes that may upset your biggest fans. By being honest, up front and facing the issues head on, you can turn these issues into opportunities to strengthen and grow your brand loyalty like Razer. While most brands communicate with their audience online, there’s an entirely different experience when you meet up in person. One of the best things Razer did was establish a presence at live events. 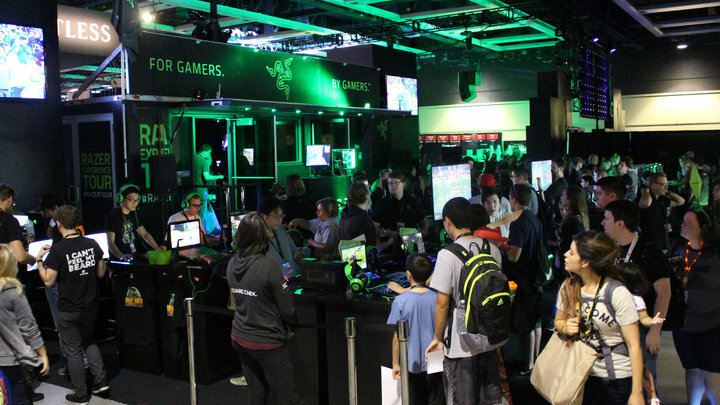 Whether it’s expos, gaming tournaments or other in-person events, Razer shows up and engages with their audience. When the company itself can’t make it out to tournaments and conventions, thanks to Team Razer they’re still able to be represented all across the world. Even though the company is based in San Francisco, sending Team Razer to various events has allowed them to take their brand global. 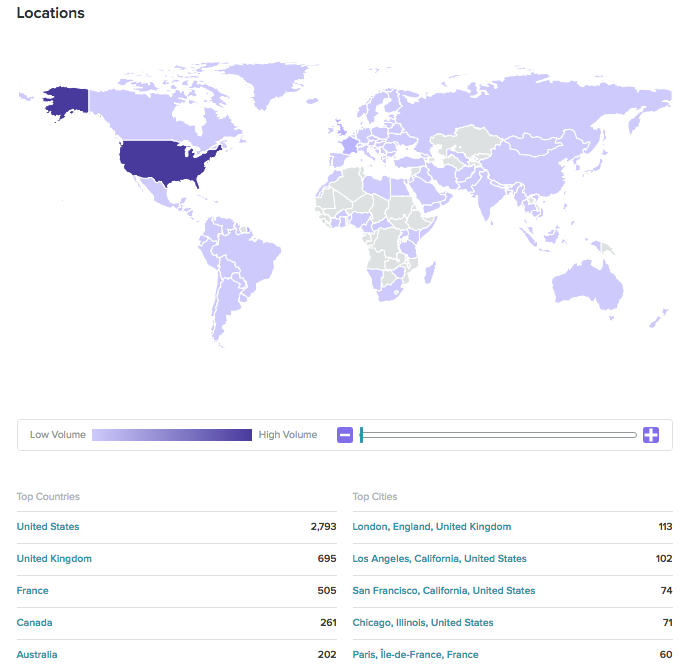 Our Listening report showed that people are Tweeting about Razer from all around the world. If your company can afford to attend events, sponsor meet ups for your community or do other things to gather your biggest advocates and brand evangelists in-person, it’s a wise move. In order to maintain and grow brand loyalty, you need to give back. Not only does it show your appreciation for your customers’ engagement and support, but it also incentivizes them to keep advocating for your brand. When Razer hit 8 million fans on Facebook, they launched a Community Appreciation Giveaway. They spread the giveaway across multiple channels including Twitter, Instagram, Razer Insider, Reddit and more. In addition to that massive giveaway, the company often teams up with other brands and partners on contests and giveaways. Some brands use contests and giveaways to build up their social media following. But once they reach a number of followers they feel comfortable with, the freebies slow down or stop altogether. Take Razer’s approach and give back to your community year-round so they feel appreciated and motivated to keep engaging. Social media plays a huge role in brand loyalty for Razer. You always hear horror stories of shrinking organic engagement on social media. While it’s true that social networks have made it more difficult for brands to get content seen organically, Razer is proof that you don’t always have to rely on social media ads for engagement. Their social media posts consistently receive hundreds, if not thousands of likes, comments and shares, because they’ve built a loyal fanbase that looks forward to hearing from them. 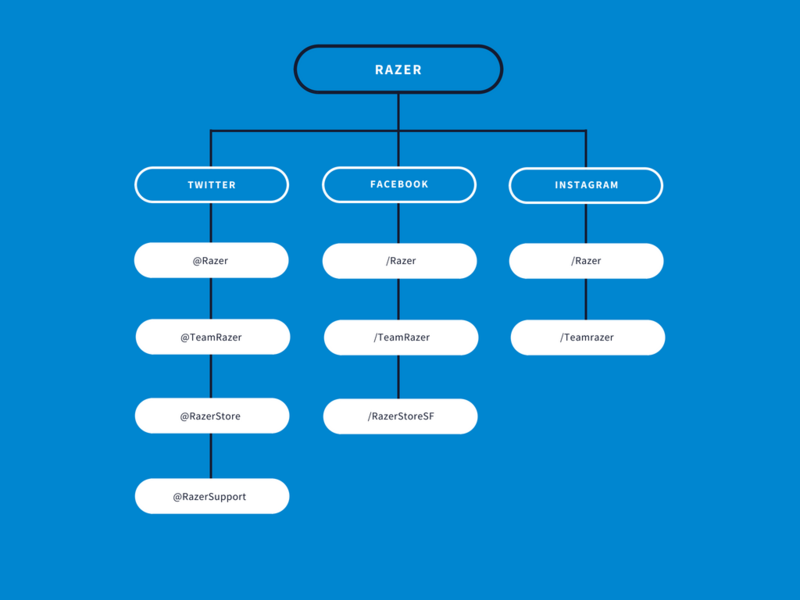 Let’s take a look at why Razer is dominating social, and how your brand can do the same. From our quick search, we found at least nine social media accounts owned by Razer on just Facebook, Twitter and Instagram. The profiles are separated by different pillars of the business. First, they have an official company profile for all the major networks, including Reddit. Then, they have separate profiles for their e-sports team, Team Razor. 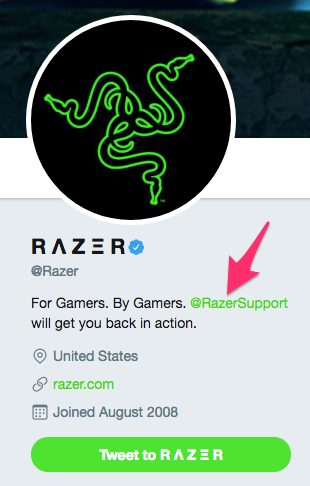 Since Twitter is often a place people go for customer support, Razer created an official customer support Handle. The last group of profiles we found are the official accounts for Razer’s physical store in San Francisco. One of the biggest benefits of having multiple social profiles is it allows people to follow the accounts most relevant to them. Just imagine if Razer tried to squeeze all the info for these separate parts of the business into a single profile on each network. It’d be much more difficult for their followers to get the info they actually care about. 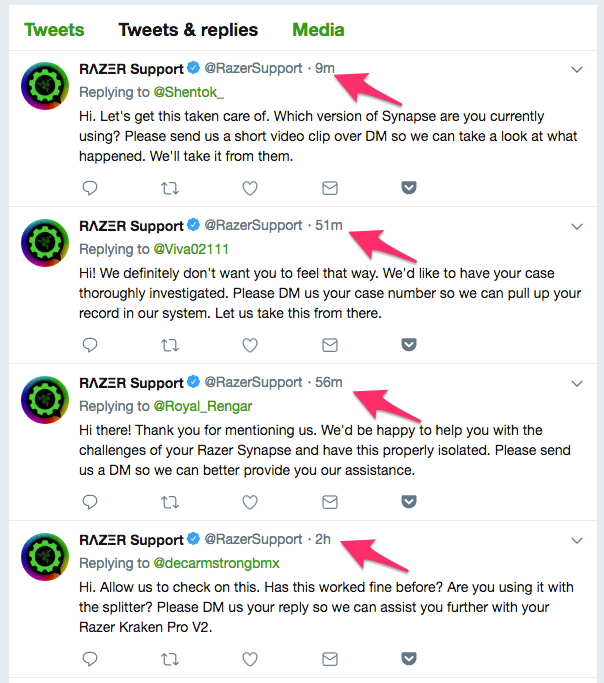 For instance, someone who bought a laptop from Razer might be interested in following their customer support Twitter profile. But a person that only cares about the e-sports aspect of the company probably doesn’t want Tweets about scheduled maintenance in their timeline. And a person in Wisconsin likely has very little interest in what’s going on at the Razer store in San Francisco. Creating multiple social media profiles also makes Razer less reliant on any one platform. For instance, if they start to see a decrease in Facebook engagement, they still have Twitter and Instagram pages to keep their social presence active. It also gives them the freedom to test different types of content on each social network. While a lot of brands simply repost the same post to every profile, Razer varies it up. For instance, to promote the new Razer Blade product, they posted this to Twitter and Facebook. But on Instagram, they used the carousel feature to show multiple pics of the new product. If you take a look at the Tweet promoting the new product, you’ll also notice they use different copy than they did for the Instagram caption. When you’re building brand loyalty, you need a great understanding of what works for your audience on each social network. 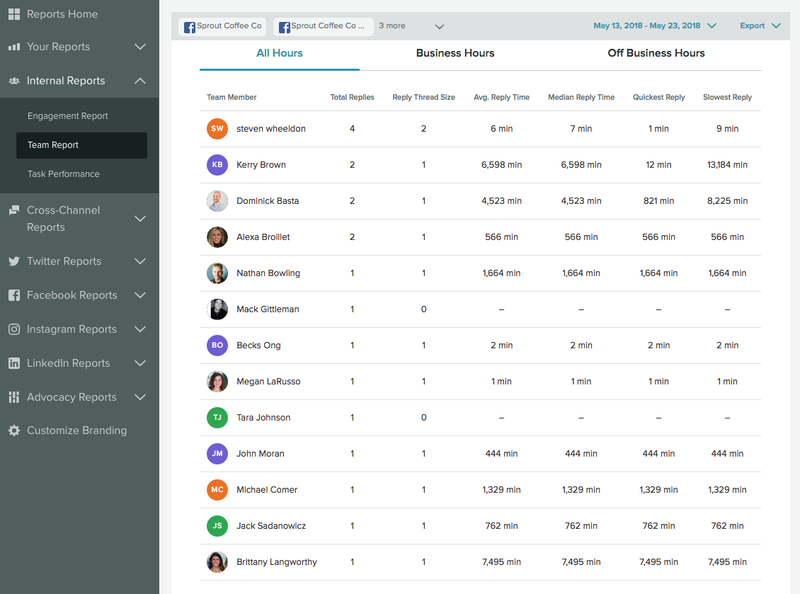 The best way to get that data is with a social media analytics tool like Sprout Social. You can see detailed breakdowns of how your content performs on each platform, and even measure them up against each other. If they were to notice their videos get more engagement than photos, their social team might be compelled to use video more by integrating Instagram Stories or Live. Creating a strategy for all your profiles is a lot easier when you have data to show what works on each. Keeping with the previous tip, when you’re trying to decide which social networks to engage on, think about where your audience is. 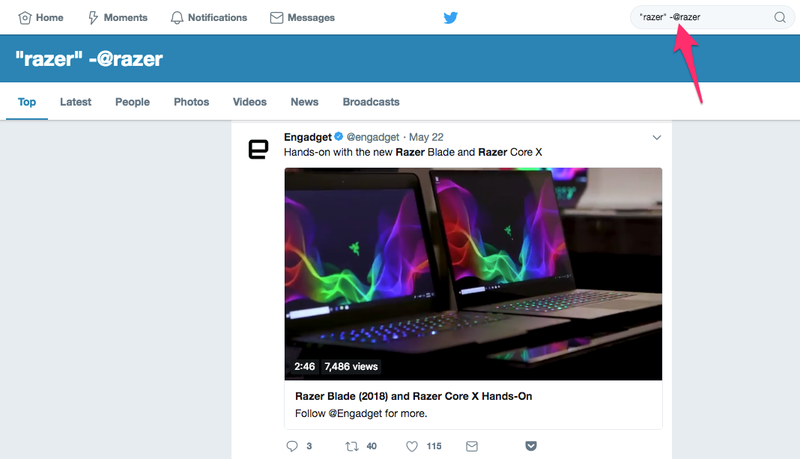 Had Razer pigeon-holed itself to the standard Facebook, Twitter and Instagram formula, they would’ve missed out on some big opportunities to connect with some of their most loyal customers on other networks. For instance, Razer has its own Subreddit community. Reddit can be a difficult channel for brands to build momentum, but it has a huge community of dedicated gamers and people into e-sports, many of which have brand loyalty to Razer. 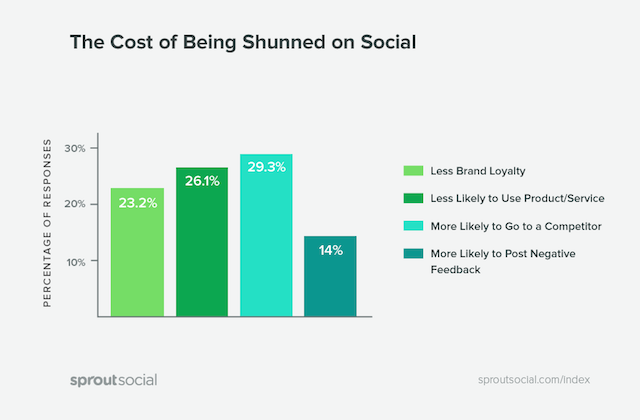 If your customers want to advocate for your brand on platforms besides Facebook and Twitter, consider establishing a presence on those channels. Beyond giving your community a place to talk, it’s also an opportunity to learn about what they want and need, as well as the issues they experience. 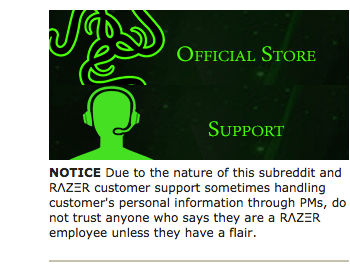 Razer also makes it easy for people to contact them by including a link to their customer support on their Subreddit page. Additionally, Razer is on Twitch, which makes perfect sense given their industry and audience. Find out where your loyal customers and target audience spends their time on social media, then jump on those platforms and engage. Not sure where to start? Take a look at our guide that details the demographics of all the major social networks. Part of building brand loyalty is making your audience feel heard. That’s why prioritizing social customer support is crucial. When you ignore your audience, you risk losing brand loyalty and chasing customers off to competitors. 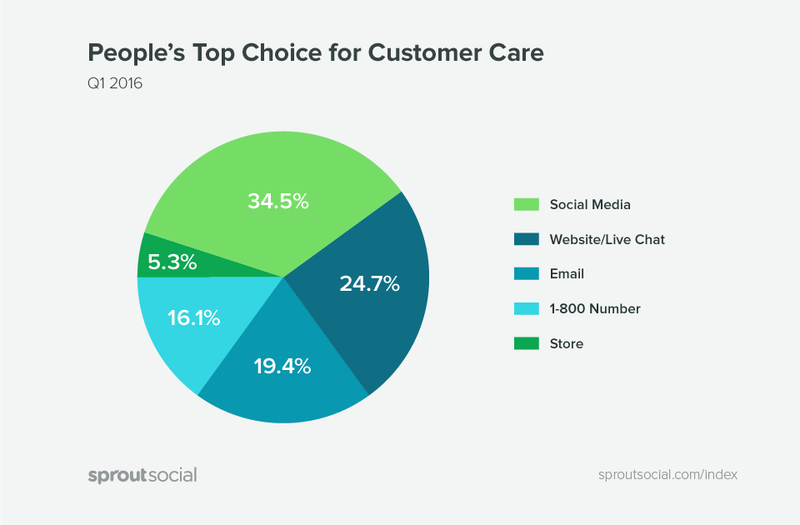 Since social media has become people’s top choice for customer support, it’s more important than ever for brands to be active and responsive on social. Razer does an amazing job replying to customers on social media, Twitter in particular. As we mentioned earlier, Razer has a separate Twitter account for customer support. They even use the Twitter bio of the official company profile to point customers to the support handle for any questions. Creating a separate Twitter handle for customer support keeps your main feed uncluttered, and makes it easier to manage customer issues. Just having a customer support profile isn’t enough though. 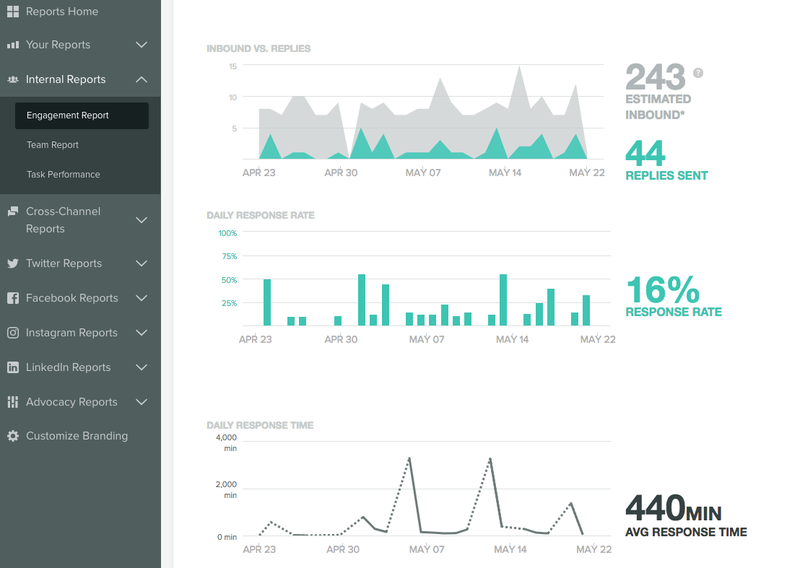 You need to respond quickly and actually help your customers. It’s called “support” for a reason. And Razer is quick to reply to people on Twitter. A quick glimpse of their replies shows their support team is pretty active. 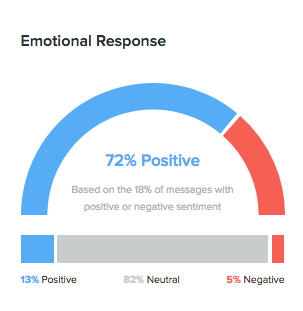 Response time is crucial on social. 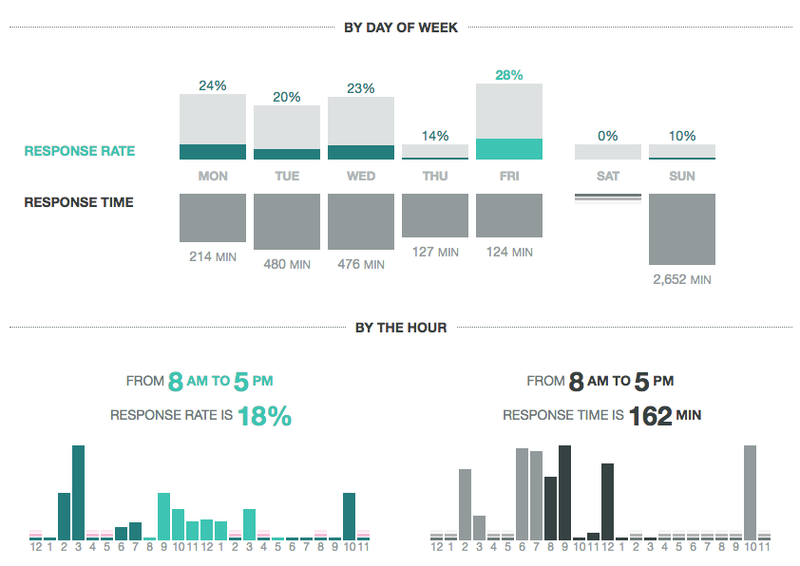 Our data shows that customers expect a reply within four hours or less. 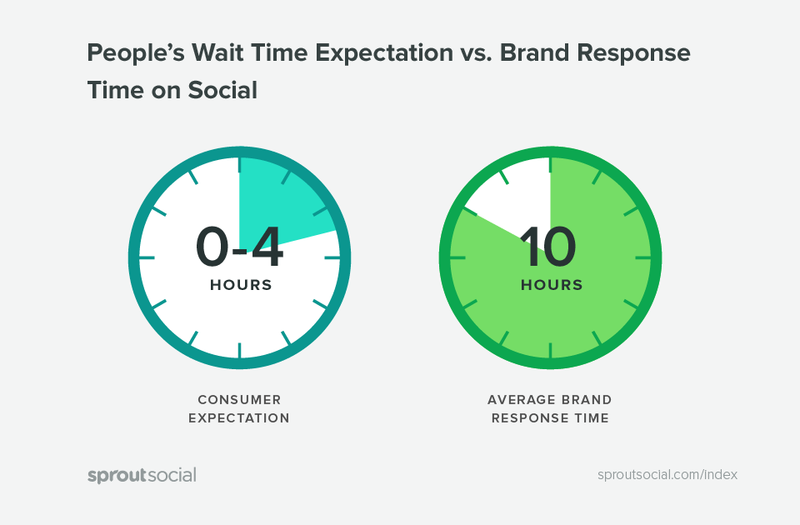 Unfortunately, most brands have an average response time of 10 hours. Yikes! Here are a few tips you can use to respond to customers quicker. 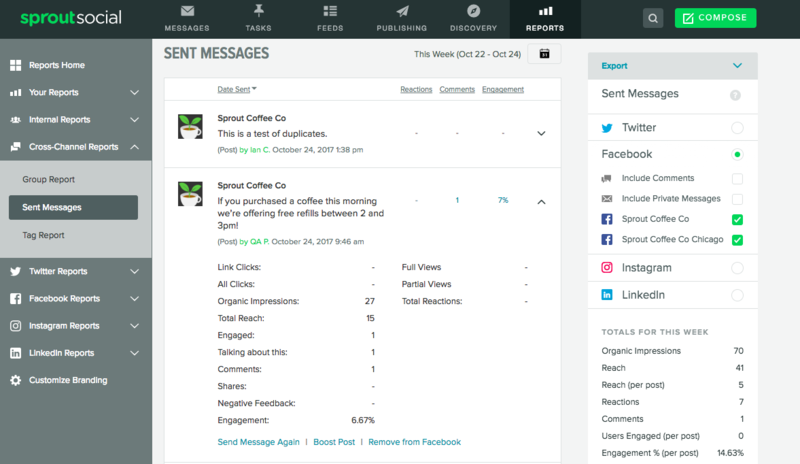 The engagement report shows your overall engagement rate and response time. You also see the data broken by day and hour. 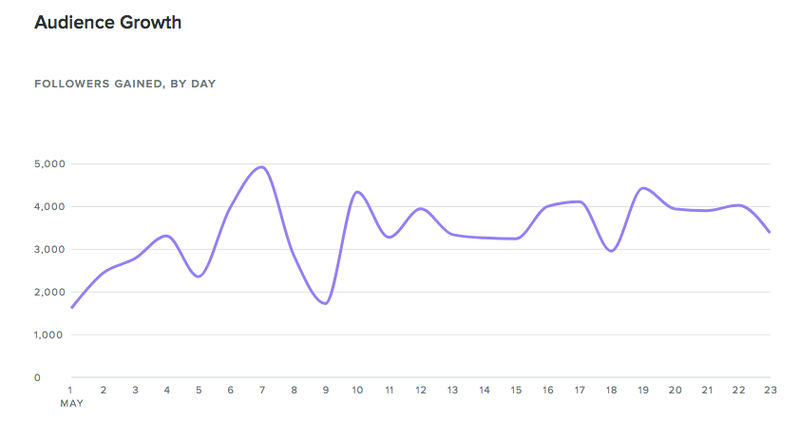 Taking this more granular look allows you to spot trends in when your social team might be lagging. For instance, in the screenshots above, it’s clear that something is going on Tuesdays and Wednesdays that’s causing a significant delay in response times. With that data, you start to dig into the cause. That’s when our Team Report comes in handy. The team report shows data on individuals on your team. This is ideal if your brand has multiple people in charge of managing your social profiles. You see which team members take the longest to reply, or who’s ignoring the most messages. One metric in this report that’s easy to overlook, but very important, is reply thread size. This measures the amount of back and forth your team members go through for each support issue. Ideally, this number should be as small as possible. Since Twitter and Facebook conversations are public, the goal of your replies should be to push the conversation to a private channel like a DM or email. That way you can get more details about their issue and avoid filling your social stream with long conversations. Razer always tries to route support issues to DM, where they can follow up in detail. Another tip to keep in mind is to monitor your brand mentions. That doesn’t mean just when someone @ messages you on Twitter. You need to monitor any mention of your brand or products regardless of whether or not you were tagged. Beyond missing out on customer service issues, you could also miss opportunities to engage with influencers. 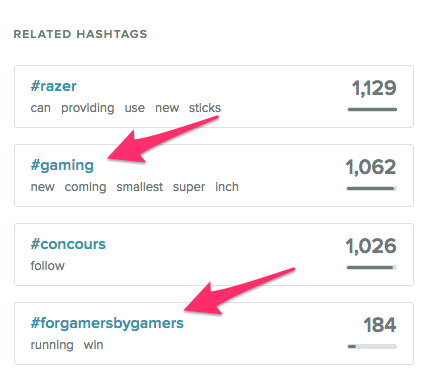 For example, a lot of major publications talk about Razer on social, but don’t always @Mention them. If Razer only monitors @Mentions on Twitter, they’ll miss out on huge shoutouts like this one from Engadget. The Tweet has a ton of engagement and mentions Razer’s products, yet the brand failed to reply or engage. They may have missed the Tweet because they aren’t monitoring every mention of their brand name. Luckily, this is a simple fix. One way is by using Twitter’s advance search operators. 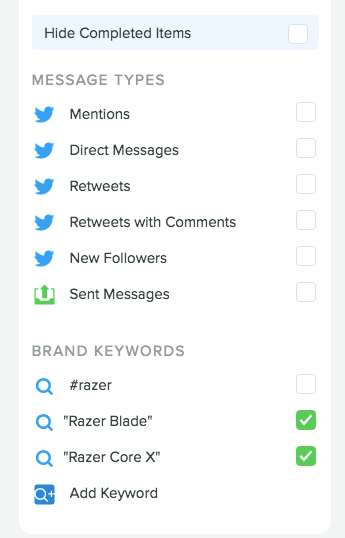 That query shows Tweets that mention the exact phrase, “razer” but don’t tag the Razer handle. While that’s a quick way to spot untagged mentions, the problem is it’s difficult to manage all the conversations. Plus, a company like Razer likely has multiple phrases they want to monitor. It’d be a pain to have to manually search every time. With Sprout’s monitoring tools, you can save searches for specific brand keywords and queries. Then you’ll see all the latest Tweets for specific phrases or hashtags. No more missed mentions! Like we said earlier, overlooking questions or comments from customers is a quick way to ruin your brand loyalty. Make sure that you’re actively monitoring all mentions of your brand on social media. Brand loyalty doesn’t happen overnight. As we’ve seen with Razer, it can take years of putting out quality products, engaging with your audience and slowly building a community to get customers to see you as the go-to brand in your industry. The benefits of brand loyalty are more than worth it though. Getting customers who fight for your brand as if it were there own is something you can’t put a price on. 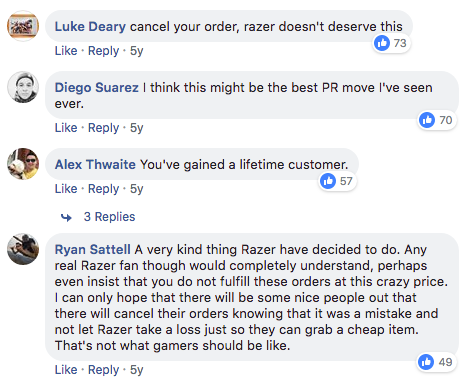 Take notes from some of Razer’s tactics and apply them to your brand, and eventually you’ll have an army of loyal advocates that consistently choose you over the competition.